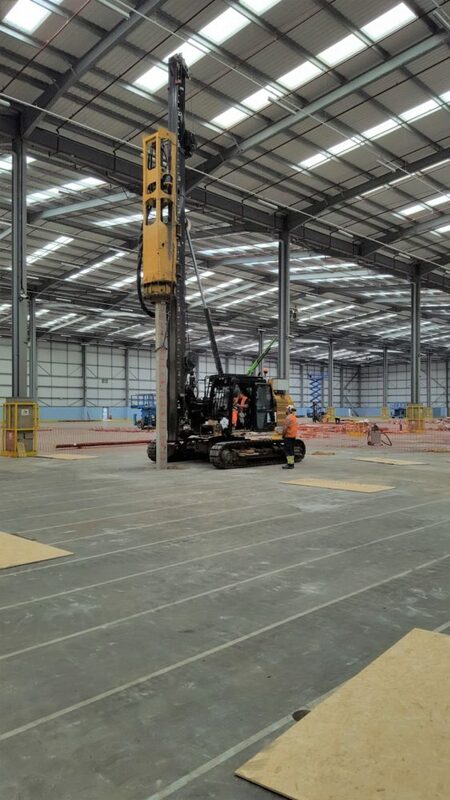 Piling inside a warehouse for a new Mezzanine floor in Hatfield. 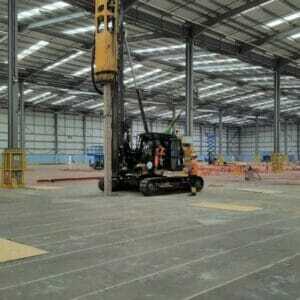 Aarsleff Ground Engineering have finished piling for a new mezzanine floor inside a warehouse in Hatfield. Warehouse Systems Limited awarded the works to Aarsleff after looking for a piling solution that would work inside the restrictions of a warehouse. For the project, Aarsleff deployed it’s bespoke Banut 300 piling rig, which due to its compact design was able to pile inside the warehouse. The Banut 300 was also modified with rubber tracks specifically for this project as to not damage the concrete floor. Aarsleff commenced work at the beginning of July and had planned to drive all 788 No. 250mm2, and 300mm2 precast concrete piles via openings that had been made within the concrete floor but ran into difficulties when initial piles refused to be driven. This was caused by a densley compacted granular layer situated just below the warehouse floor, of which Aarsleff and Warehouse Systems were both unaware of before the works had begun.